Think you have the perfect set-up? This £1500 cable from Atlas says otherwise | What Hi-Fi? The hand-made Atlas Mavros Ultra SE Interconnect is gold-plated, comes with a certificate of authenticity and is going to make audiophiles very happy at Christmas. Some people will go to extraordinary lengths to get the best quality audio equipment, whether it's building a levitating turntable, erecting your own personal pylon, or buying a 24k solid gold music system. 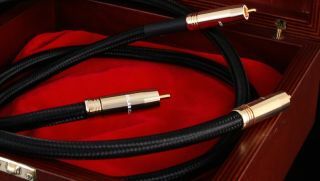 But for audiophiles with expensive tastes, there's a new cable for the Christmas wishlist: the limited edition Atlas Mavros Ultra SE Interconnect. So why does this interconnect have such a high price tag? For a start, only 50 sets are being made; each purchase comes packaged in a special Atlas presentation box, complete with a signed limited edition authenticity certificate. Then there's the build. The Mavros Ultra features goldplated Ultra RCA plugs, and is made with Ohno Continuous Cast (OCC) grain-free copper which aims to reduce corrosion and claims a lower electrical resistance. The interwoven conductors are covered by an electrostatic screen with copper shielding braid, which Atlas says decreases electromagnetic interference and noise. For the dielectric (a polarising insulator), the cable has a microporous Teflon tape wound around the copper conductors, covered by a protective PolyEthylene sleeve. This aims to offer greater manufacturing consistency and wider bandwidth. MORE: The £3699 oBravo EAMT-1s - the world’s most expensive in-ear headphones?